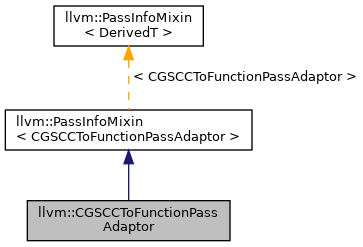 Designed to allow composition of a FunctionPass(Manager) and a CGSCCPassManager. Note that if this pass is constructed with a pointer to a CGSCCAnalysisManager it will run the FunctionAnalysisManagerCGSCCProxy analysis prior to running the function pass over the SCC to enable a FunctionAnalysisManager to be used within this run safely. Definition at line 429 of file CGSCCPassManager.h. Definition at line 432 of file CGSCCPassManager.h. Definition at line 437 of file CGSCCPassManager.h. Definition at line 440 of file CGSCCPassManager.h. Definition at line 448 of file CGSCCPassManager.h. Definition at line 454 of file CGSCCPassManager.h. References llvm::PreservedAnalyses::all(), assert(), C, llvm::dbgs(), F(), llvm::PreservedAnalyses::getChecker(), llvm::InnerAnalysisManagerProxy< AnalysisManagerT, IRUnitT, ExtraArgTs >::Result::getManager(), llvm::AnalysisManager< IRUnitT, ExtraArgTs >::getResult(), llvm::PreservedAnalyses::intersect(), llvm::AnalysisManager< IRUnitT, ExtraArgTs >::invalidate(), LLVM_DEBUG, llvm::LazyCallGraph::lookupSCC(), N, Pass, llvm::PreservedAnalyses::preserve(), llvm::PreservedAnalyses::preserveSet(), llvm::SmallVectorTemplateBase< T >::push_back(), llvm::PassInstrumentation::runAfterPass(), llvm::PassInstrumentation::runBeforePass(), and llvm::updateCGAndAnalysisManagerForFunctionPass(). Definition at line 443 of file CGSCCPassManager.h.